We're in love with cupcakes at Governor's HQ and we've adapted this gorgeous recipe from Robicelli’s: A Love Story with Cupcakes by Alison and Matt Robicelli. We're sure you'll enjoy it as much as we did with it's mixture of smooth and crunchy textures. To make the cupcakes, preheat the oven to 350ºF (180ºC) and line two 12 cup muffin pans with cupcake liners. Mix the cocoa powder and hot coffee together in a medium bowl, stirring until it’s a thick paste. In a separate bowl, stir together the buttermilk, oil, vanilla, egg, egg yolk, and salt. Gradually stir the buttermilk mixture into the cocoa, mixing until smooth. Sift together the flour, sugar, baking powder, and baking soda. Bake the cupcakes for 20 to 25 minutes, until the centres lightly spring back when you touch them. Let cool completely. To make the peanut butter buttercream, put the water, sugar, corn syrup, and cream of tartar in a heavy, nonreactive saucepan fitted with a candy thermometer. Put the egg yolks and the egg in the bowl of a stand mixer fitted with the whip attachment. Turn the mixture to high speed and let whip until the eggs become thick and hold their shape. When the sugar syrup reaches 235ºF (113ºC), turn off the mixer, add the xanthan gum, then turn it back on. With the mixer on medium-high speed, rest the syrup pot against the side of the bowl and gradually pour the syrup into the eggs in a slow, steady stream – making sure to aim between the sides of the bowl and the whip. Do not pour too fast, or you’ll scramble the eggs. Turn the mixer back to high and whip until the side of the bowl feels cool to the touch. Once the mixture is cool, remove the whip and replace with the paddle attachment. Cut the butter into tiny slivers or bits, no thinner than a slim coin or no larger than peas, and add them one-by-one while the mixer is going at medium-high speed. Continue beating and adding the butter until it’s all added and smooth. When done, switch the speed to low and add the peanut butter, salt, and vanilla. Taste, and add more peanut butter a tablespoon at a time, if desired, until the right taste is achieved. You can add more salt as well. Spread the buttercream thickly over the cupcakes, or pipe it in mounds over each cupcake, using a pastry bag fitted with a large plain tip (1/2-inch, 1,75cm), then refrigerate the cupcakes for 20 minutes. If you don’t use it all, see the notes for freezer storage. 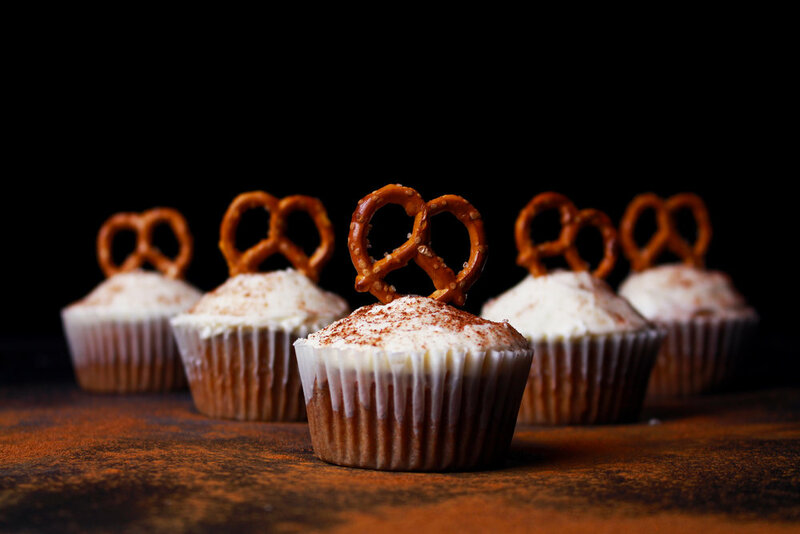 Serve the cupcakes at room temperature with a single pretzel topping each. You can chill them for up to a day or two before serving, although the pretzels on top will soften. If you plan to refrigerate them for 1-2 days, frost cupcakes the cupcakes first and chill them, then top with the pretzels directly before serving.